This is a real statement from one owner of our Pet Hero pet that received treatment for nose cancer. Nasal tumors are found in the nasal cavity and the paranasal sinuses and affect cats. Does My Cat Have Nasal Cancer? Because these tumors are hidden inside the nasal cavity, they are more difficult to detect. By the time signs are noticeable to the owner and a diagnosis is made, nasal cancer is typically at an advanced stage. Nasal tumors are locally aggressive. This means that instead of metastasizing or spreading to other areas of the body, the cancer cells are aggressive where the tumor is located. Nasal tumors can eat away at the surrounding tissues, bone plate, and even into the cranial vault that the brain occupies. Understanding the signs and symptoms of a nasal tumor is vital for early detection. If your cat displays these signs or symptoms of nasal cancer, have your pet examined by your primary care veterinarian as soon as possible. Nasal discharge is the most common clinical sign of a nasal tumor. The discharge may contain mucous, pus, and blood. Cats are quick to lick their noses, so close attention to your pet is necessary when you first notice a runny nose. Also, check their bedding and blankets for nasal discharge. Along with a runny nose, excessive sneezing is another common sign. 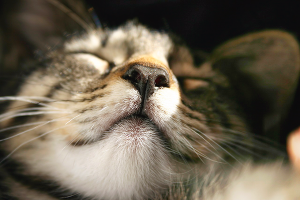 Unfortunately because sneezing is also a common sign of allergies and infections in the upper respiratory tract, your veterinarian may treat your cat with medication for a different condition—especially if the nasal cancer is in the early stages. The medication may alleviate the sneezing temporarily but it will eventually return. If you notice your pet sneezing even after medication, don’t hesitate to notify your veterinarian. If your cat has always been a quiet sleeper and begins to snore loudly, it may be a sign of a tumor blocking the nasal airways. When awake, the symptom can be recognized by noisy breathing or shortness of breath. A bloody nose is never okay. Causes can be from trauma to the nose, allergies, upper respiratory infection, bacterial infection, dental problems, or a possible tumor. As the cancer advances, bloody noses can become more frequent. As the tumor grows, your cat may show signs of discomfort. They may rub their face on the ground, your leg, or other surfaces. They may also paw at their face constantly. As the nasal tumor spreads and grows, it can push against the facial muscles and bones, creating a deformity. You may notice a general swelling of the face or that the face is no longer symmetrical. The nose can become misshapen. The tumor can also push into the ocular area, causing an abnormal bulge of the eyes as well as cause discharge from the eyes. As mentioned previously, nasal cancer can extend into the cranial vault. As the tumor begins to invade the brain, your cat may exhibit neurological signs, like seizures or behavioral changes. Facial deformity, seizures, and frequent nosebleeds indicate that the nasal cancer is no longer in the early stages, and the cat should be taken to a veterinarian for testing as soon as possible. While the above are some of the common signs of a nasal tumor, there are other signs of cancer that don’t include the face. For example, weight loss, weight gain, a persistent cough, and wounds that won’t heal are also signs of cancer. Read our “Top 10 Warning Signs of Cancer in Your Pet” article for more information. The first step of action is pain management. Depending on the stage of the cancer, your pet may be in a lot of pain. It will likely be prescribed anti-inflammatory drugs and opioids to relieve pain throughout treatment. For nasal tumors, radiation therapy is the preferred standard of treatment for cats. Due to the sensitive location, surgery is often difficult. Before the introduction of stereotactic radiation (SRS/SRT) in veterinary medicine, the most advanced radiation therapy available to pet owners was conventionally fractionated radiation therapy (CFRT). CFRT can treat the tumor in ways surgery or chemotherapy can’t and in many cases is the recommended course of treatment, but there are also disadvantages. The radiation delivered to the tumor can damage the normal, healthy tissue surrounding it. In order to keep side effects as minimal as possible, the radiation is delivered in smaller doses over the course of anywhere from 15 to 30 sessions under anesthesia. Prognosis varies by case, but the median survival time for cats after advanced radiation therapy ranges from 6-18 months depending on the type of cancer and how early it was treated.2 As with any cancer, the earlier it is diagnosed and treated, the better the chances that treatment will be successful. 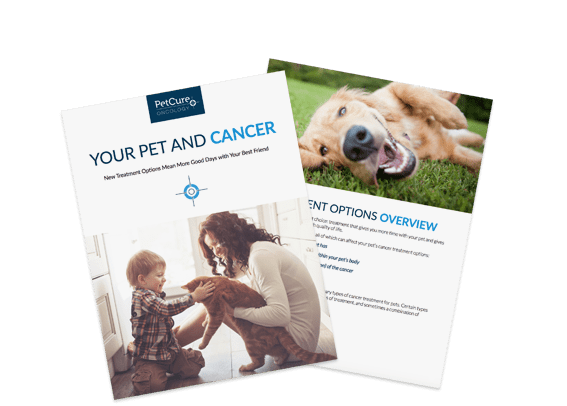 As of March 2017, 14% of all cancers treated by PetCure Oncology have been nasal tumors. Here are a few our inspiring Pet Heroes that have fought nasal cancer. We invite you to read their stories. If your pet has been diagnosed with cancer, contact a PetCure Oncology location near you. Our team members are ready to help answer your questions.